Passport (Passierschein) incl. 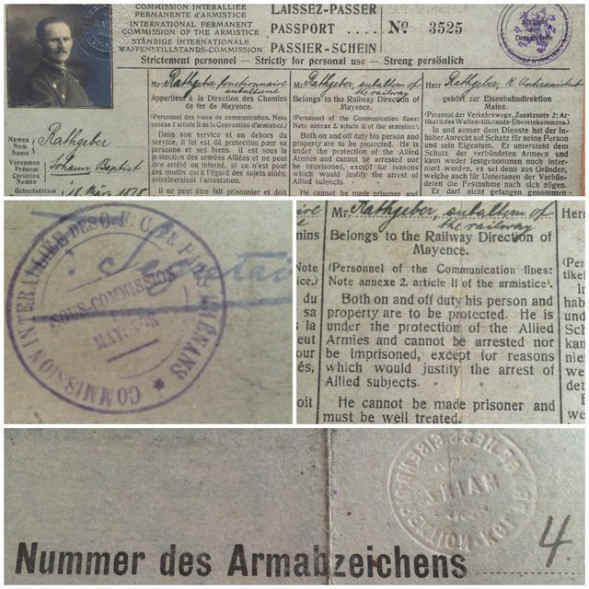 Photo of the International Permanent Armistice Commission , issued by the Railway Headquarters in Mainz for the assistant Johann Baptist Rathgeber. He can not be arrested nor be imprisoned. He must be well treated and is under the protection of the Allied Armies! Interesting document of WWI. The German Armistice Commission in 1918 (in short: WaKo) was compiled end of the First World War and the should be represented German interests in the ceasefire negotiations with the agreement. The WaKo received the power of attorney for signing the contract on 11 November 1918 in a railroad car in a forest near the French town Rethondes, near Compiegne, France. The armistice between the Allies and Germany – also known as the Armistice of Compiègne after the location it was signed – was an agreement that ended the fighting in the First World War. It went into effect at 11 am on 11 November 1918, and marked a victory for the Allies and a complete defeat for Germany, although not technically a surrender. The Germans were responding to the policies proposed by American president Woodrow Wilson in his Fourteen Points of January 1918. The actual terms, largely written by French Marshal Ferdinand Foch, included the cessation of hostilities, the withdrawal of German troops to behind their own borders, the preservation of infrastructure, the exchange of prisoners, a promise of reparations, the disposition of German warships and submarines, and conditions for prolonging or terminating the armistice. Although the armistice ended the actual fighting, it took six months of negotiations at the Paris Peace Conference to conclude the peace treaty, the Treaty of Versailles.